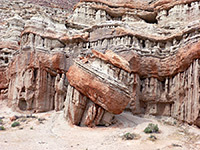 In the southernmost foothills of the Sierra Nevada range, Red Rock Canyon State Park covers an area of badlands and exposed, angled, mudstone strata which form low cliffs and branched ravines, with the rocks eroded into many wonderful forms. Despite its proximity to the mountains, the surrounding region still presents a completely desert appearance and the approach from the south passes through wide, empty, desolate valleys with little or no vegetation, crossed by long straight roads such as the busy Hwy 14, between Mojave and US 395, which runs through the middle of the park. 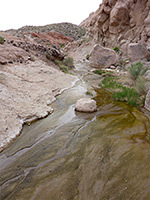 The road follows a seasonal wash along a shallow valley - Red Rock Canyon - although not all is especially interesting since the colorful sedimentary formations are found only in certain places; other parts are bordered by dull, dusty scrubland. The colors of the rocks become considerably brighter and more vivid after rainfall. Overall, the state park is interesting but relatively small so unless camping, a couple of hours spent exploring is probably enough - maybe less in summer as temperatures can be quite extreme. The best time is during the spring wildflower season. Red Rock Canyon State Park is 6 by 9 miles in extent and spans both sides of CA 14, though most of this area, to the east, is accessible only by 4WD tracks and as a result is rarely visited. Much of the best scenery can be seen from the highway, and the two most frequently visited locations are found a short distance west. One is around the Ricardo campground (named after an old settlement at this location, established in the 1890s), set at the base of white cliffs and hoodoos, and reached by a short, paved side road; a nice place to camp since the 50 sites are quite well-separated and many are set right amongst the formations at the foot of the canyon walls. The visitor center/park headquarters is located nearby, and there are several short hikes that lead up the cliffs and through the adjacent cactus-covered land. 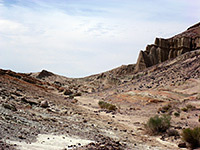 The second main site of interest along Hwy 14 is Hagen Canyon, just south of the Ricardo turn-off - a one mile long side valley with intricately eroded, multicolored cliffs, washes and mounds, somewhat similar to the Bisti Wilderness of distant New Mexico. 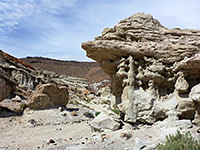 The rocks here have various different strata in shades of red, white and grey, and are topped by a band of black lava, each layer having eroded in different ways. 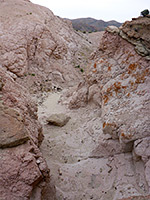 The northern reaches of Hagen Canyon are crossed by an easy, one mile, partial loop trail though visitors are encouraged to walk anywhere; some of the most photogenic formations are beyond the path towards the upper end of the drainage, to the southwest. There are three main access points into the larger, eastern section of the park: at Iron Canyon (1.5 miles south of the camp turn-off), along Opal Canyon Road (3.5 miles north) and from the north parking area, 0.9 miles north. 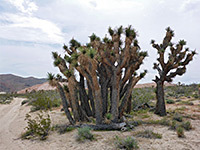 All three tracks are also suitable for hiking, and perhaps the best, for a short trip, is that from the north parking area; this route climbs slightly to a junction near a closely-spaced group of Joshua trees, from where the right branch, signed 'scenic canyon' descends a slope and comes close to a shallow ravine to the north. Upstream, this leads to an enclosed, quite pretty section that often contains shallow, flowing water, and is met by a short, slot-like tributary through crumbling, pinkish, unvegetated rocks, soon ending beneath a dryfall. A little way east are some dull, red and grey cliffs, similar to those alongside Hwy 14 near Hagen Canyon.